In this tall tale, "Barb Howard takes on Alberta's petro-chemical industry with a zest and irreverence." "From doodle bugging to roughnecks, from gas pumps to gushers ... a comic tour de force." Something surreal happens when Nellie Mannville, an employee in an oil company cafeteria, takes a field trip to a drilling rig. What follows is an equally surreal pregnancy and a humorous, historical drive through our ballooning petroleum habits. An oil patch tall tale with a feminine twist. Whipstock was a finalist for the Writers' Guild of Alberta 2001 Henry Kreisel Award (best first book by an Albertan). 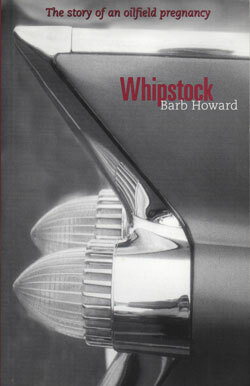 A glance at the cover of Barbara Howard's Whipstock delightfully signals the bawdy laughs within, a close-up profile of the conical taillights of a winged 1957 Pontiac, as obvious an allusion to a fine woman's bosom as ever was conceived on the gm assembly line. Whipstock rightfully belongs in the same proud picaresque line of western writing as Robert Kroetsch and Aritha van Herk, both of whose cheery blurbs grace the back cover. Barb Howard's first novel pokes fun at the Alberta oil industry in a rollicking tale replete with a quirky cast of characters and an unconventional plot. Told in an understated voice, the story contains elements of magic realism achieved by the juxtaposition of the absurd and the mundane. This technique not only captures the reader's attention, but also helps to deliver an absorbing and entertaining satire. You've wondered about the oil patch and its secrets and shenanigans. Tune in. Barb Howard was there. She tells all, and keeps you laughing out loud while you listen...Oilmen, start to squirm. You are about to be whipstocked. For details read on. In this marvelous tall tale, Barb Howard takes on Alberta's petro-chemical industry with a zest and irreverence that will have everyone climbing oil derricks. From doodlebugging to roughnecks, from gas pumps to gushers, this parable of pregnancy a petroleum is a comic tour de force.